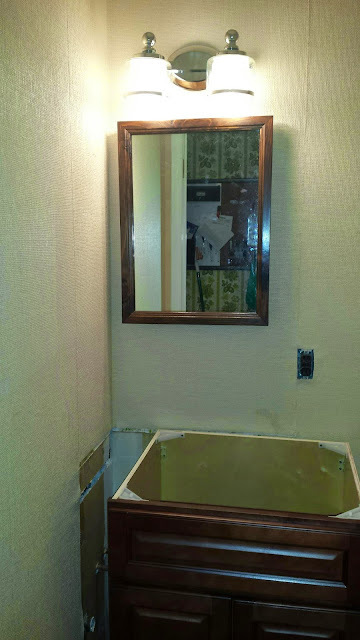 So our powder room is quite small, I needed a design to really make the room seem as big and open as possible. No dark colors here. Trust me, in that I'm not afraid of dark, but I didn't want this to seem like a cave. It had this dirty yellow striped wallpaper that needed to go. Under the paper the walls were in no shape to be painted without major patch work and let's just say, been there done that. So a thick wallpaper it is. And you'll know I love grasscloth wallpaper. Being the thrifty consumer I am, I went to ebay to find a good deal. Let me tell you, grasscloth is not cheap. I found two double rolls for about 60 bucks with shipping so not too bad. It was more of a weave, and when I got it I had some reservations. It seemed kinda boring, so I consider spray painted in a metallic to bring it to life. I tried both silver and gold but both seemed a little gaudy. I went with the natural and love it!! In the small space it really warms it up. 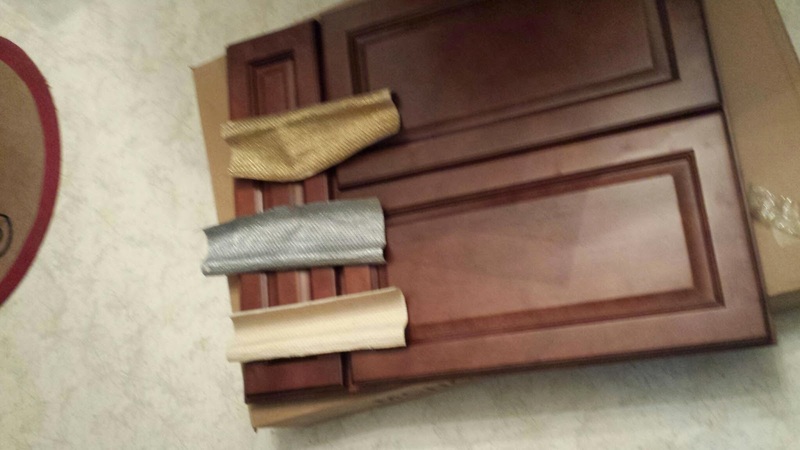 The vanity cabinet is a flat pack from the KSI warehouse, the light fixture is from Home Depot. 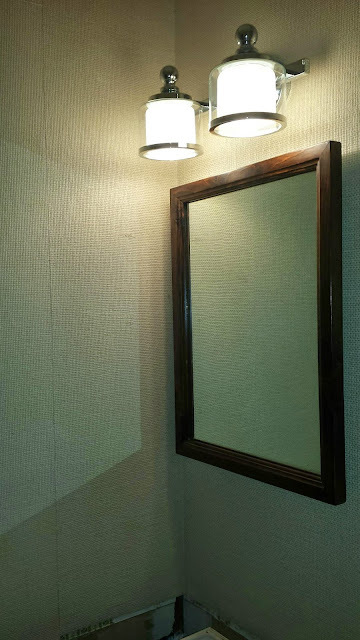 It seems like vanity lighting is either ugly or super expensive. This one was around 70 bucks and I think it looks pretty good. Not to mention, I put it in all by my self! The counter top is on its way from Menard ' s but more on that later.